Appointments available Monday-Friday, 8:30 AM – 4:30 PM. In addition to leading edge treatments including negative pressure wound therapy, bio-engineered tissues, biosynthetic dressings and growth factor therapies – our Wound Center offers Hyperbaric Oxygen Therapy, which works by exposing the patient to 100 percent oxygen to help support the healing process. 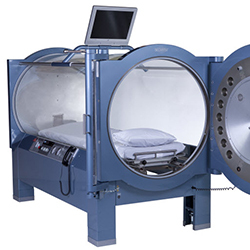 Hyperbaric Oxygen Therapy (HBOT) is used to treat more than a dozen medical conditions including foot ulcers, radiation injuries to tissue and bone, necrotizing infections, compromised skin grafts and skin flaps, some types of arterial insufficiency and ischemia. There is no need for patients to live with non-healing wounds for unnecessary prolonged amounts of time. Patients must realize that If left untreated, chronic wounds can lead to diminished quality of life and possible amputation of the affected limb. Receiving proper treatment is crucial. Chronic wounds affect approximately 6.7 million people in the United States. 1 in 4 family members are affected, and that number is expected to rise at a rate of 2% annually over the next decade. We can help. Our proven care is covered by most insurance plans and Medicare. Talk to your provider or call us for an appointment today.